Each of these three nutrients is designated by a number - a percentage of the pounds of each per hundred pounds of fertilizer. For example, a vary common 20-10-5 formulation means there are 20 lbs. of nitrogen per hundred pounds of fertilizer, 10 lbs. of phosphoric acid and 5 lbs. of potassium. In a 50 lb. bag with the same formula on it, there would be 10 lbs. of nitrogen, five of phosphoric acid and two and a half of potassium. 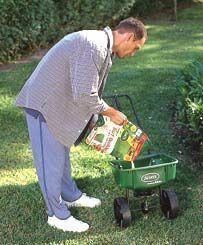 Can you get along with just one application of fertilizer? Yes, but the lawn won't be very healthy. Two feedings are minimum, although most turf experts believe three feedings - or more - are best.